The iconic J Class yachts will return to their origins, competing on the waters of the 34th America's Cup in Bermuda in June 2017. 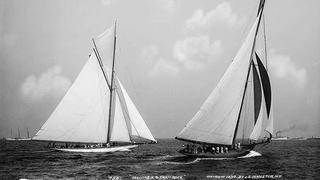 It's been 80 years since J Class yachts competed in the America's Cup, and now the majestic sailing yachts will make a triumphant return to the racecourse of the oldest trophy in international sport. The J Class Association and the America's Event Authority have just announced an agreement to hold a J Class regatta preceding the America's Cup in Bermuda, taking place between the America's Cup Challenger Playoffs and the America's Cup Match (the much-anticipated finals) in June 2017. The America's Cup race management team will organise racing for the J Class regatta, and the final two days of racing are expected to fall on either side of the opening weekend of the America's Cup Match. The J Class Association told Boat International that they are hoping all of the J Class yachts will be in Bermuda to participate. The current seven-boat strong fleet comprises: Endeavour, Hanuman, Lionheart, Rainbow, Ranger, Shamrock V, Velsheda, and an eighth J Class yacht is due to launch in May 2015. Endeavour was recently listed for sale, an intriguing opportunity for a racing enthusiast who would like to part in the next Cup on an original J Class. Legendary J Class yacht Shamrock V is also available for sale, and Ranger is for sale, a beautiful replica of the original which won the 1937 America's Cup. The classic beauties will be moored at the to-be-built America's Cup Village in Bermuda, providing a contrast to the new AC62s. The graceful, slim and undeniably beautiful J Class yachts cut a stark contrast to the futuristic fast-flying hydrofoil multihull racing machines that are used in the Cup today. But this polarity only captures how advanced each craft is in its day. "All the America's Cup challengers and defenders are at the forefront of design and development of our sport in their time – from the J's to the latest America's Cup designs," J Class Association representative Louise Morton told Boat International. " showcases the tradition and progress of this iconic event." While a handful of J Class yachts have met in recent years to participate in their own class in regattas, such as Les Voiles de St Tropez, seeing the elegant sailing yachts back on the America's Cup racecourse truly will be a sign of the event coming full circle. “The America’s Cup organizers have offered the J Class a unique opportunity to be part of the America's Cup for the first time in eighty years", Morton says. "The Owners and the Class are very much looking forward to this unique opportunity and to have a J Class regatta during the America's Cup." This isn't the first time a non-America's Cup Match event was held during the Cup. During the 2013 Cup, Boat International hosted the America's Cup Superyacht Regatta, which saw spectacular sailing on the Cup racecourse in San Francisco Bay during the Cup laydays, and was handily won by Adela. Stay tuned for an announcement of an America's Cup superyacht programme for the 2017 Cup in Bermuda.